The first clothing item I ever designed was this granny square poncho for my sweet little girl. She was only three at the time and cute as a button. Today, she turns five! I can’t believe how time has flown by and how far my designing skills have come since then. To celebrate, I’ve decided to release this pattern! It has been tested by only one tester, so please understand that there may be some issues with it. I am going to revisit it in the near future to make in larger sizes as well. I will come back and edit this posting at that time. For now, this granny square poncho will fit most children size 2T or smaller. It is written in US crochet terms. You can download a PDF version at the bottom of this page. Gauge/Tension: 3 rounds = 4 in x 4 in. Check your gauge and change to a different size hook to obtain gauge if needed. Size: One size fits most. Length is approximately 12 inches from neck to corner at middle point. 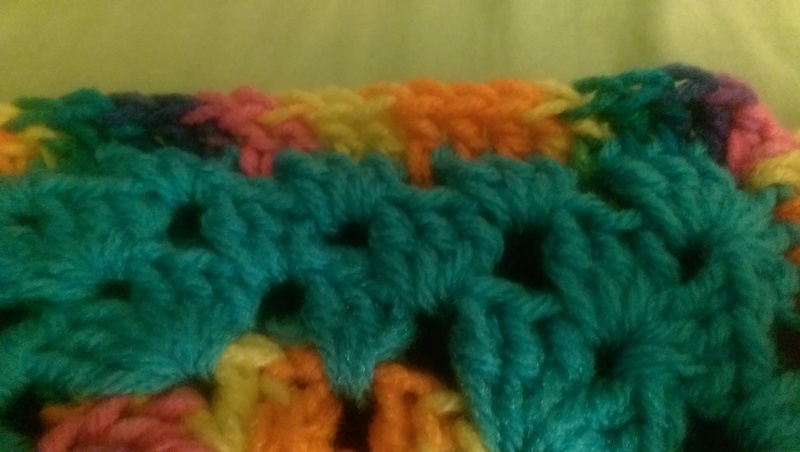 Abbreviations: A = Color A; B = Color B; ch = chain; sc = single crochet; dc = double crochet; sl st = slip stitch; sp(s) = space(s); st(s) = stitch(es); () = work directions in parentheses into same st;  = work directions in brackets the number of times specified; * = repeat whatever follows the * as indicated. Foundation Round: With A, ch 6, sl st in first ch to form a ring. Round 1: Ch 3 (counts as first dc), 2 dc into ring, [ch 1, 3 dc into ring] 3 times, ch 1, sl st into top of ch 3. Round 2: Sl st into next 2 dc and into ch-1 sp, ch 3 (counts as firsts dc), (2 dc, ch 1, 3 dc) into ch-1 sp. [Skip next 3 dc, ch 1, (3 dc, ch 1, 3 dc) into next ch-1 sp] 3 times, ch1, sl st into top of beginning ch 3. Finish off. Round 3: Join with B in any corner ch-1 sp, ch 3 (counts as first dc), 2 dc, ch 1, 3 dc into ch-1 sp, [skip next 3 dc, ch 1, 3 dc into next ch 1 sp, skip next three dc, ch 1, (3 dc, ch 1, 3 dc) into ch-1 sp] 3 times, skip next 3 dc, ch 1, 3 dc into next ch-1 sp, skip next 3 dc, ch 1, sl st into the top of ch 3. Round 4: Sl st into next 2 dc and into ch-1 sp, ch 3 (counts as first dc), (2 dc, ch 1, 3 dc) into ch-1 sp, *[skip next 3 dc, ch 1, 3 dc into next ch-1 sp] 2 times, skip next 3 dc, ch 1, (3 dc, ch 1, 3 dc) into next ch-1 sp, repeat from * 2 times, [skip next 3 dc, ch 1, 3 dc into next ch-1 sp] 2 times, skip next 3 dc, ch 1, sl st into top of ch 3. Round 5: Sl st into next 2 dc and into ch-1 sp, ch 3 (counts as first dc), 2 dc, ch 1, 3 dc into ch-1 sp, *[skip next 3 dc, ch 1, 3 dc into next ch-1 sp] 3 times, skip next 3 dc, ch 1, (3 dc, ch 1, 3 dc) into next ch-1 sp, repeat from * 2 times, [skip next 3 dc, ch 1, 3 dc into next ch-1 sp] 3 times, skip next 3 dc, ch 1, sl st into top of ch 3, finish off. 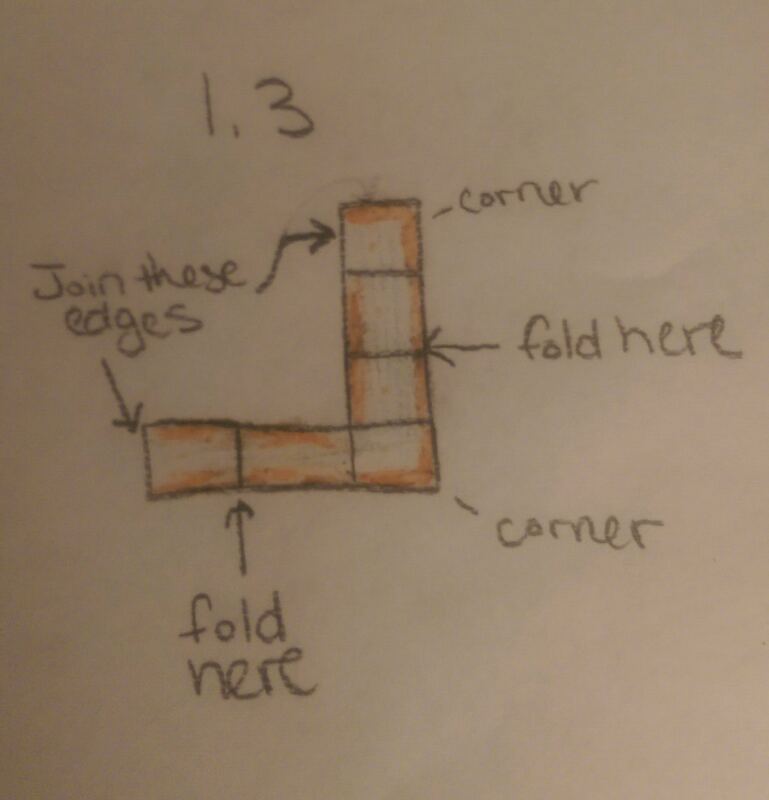 Border: Join with A at any corner ch-1 sp, ch 3 (counts as first dc), ch 1, 1 dc in next dc and every dc and ch-1 sp to next corner ch-1 sp, (dc, ch 1, dc) in corner ch-1 sp, 1 dc in each dc and ch-1 sp to next corner ch-1 sp, (dc, ch 1, dc) in corner ch-1 sp, finish off (42 dc). Border: Join with A at any corner ch-1 sp, ch 3 (counts as first dc), 1 dc in every dc and ch-1 sp to next corner ch-1 sp, finish off (21 dc). Repeat on opposite side of motif. Joining: Line up 2 Main Motifs so that the sides without borders are touching. 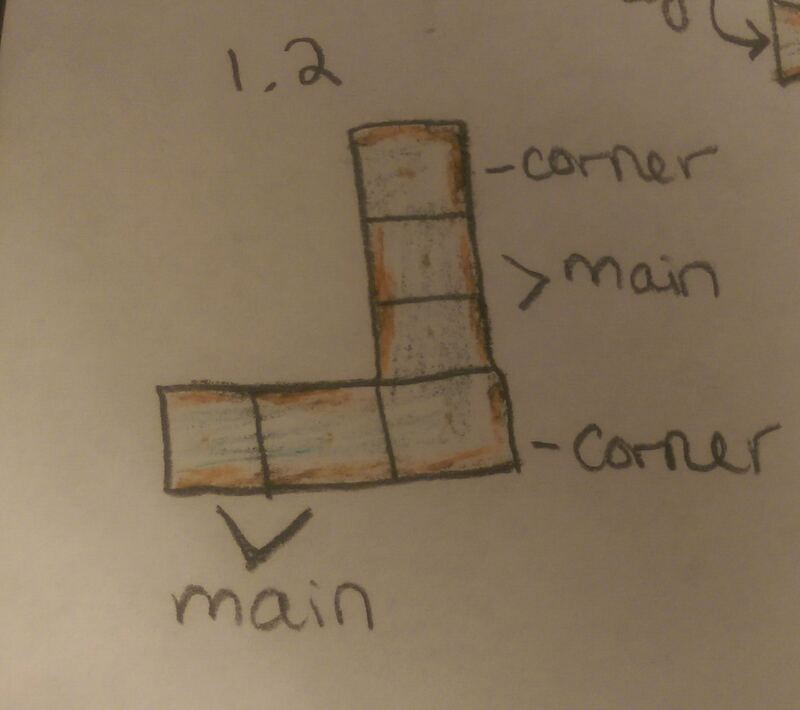 Lay these blocks back to back instead face to face as you do with most joining. 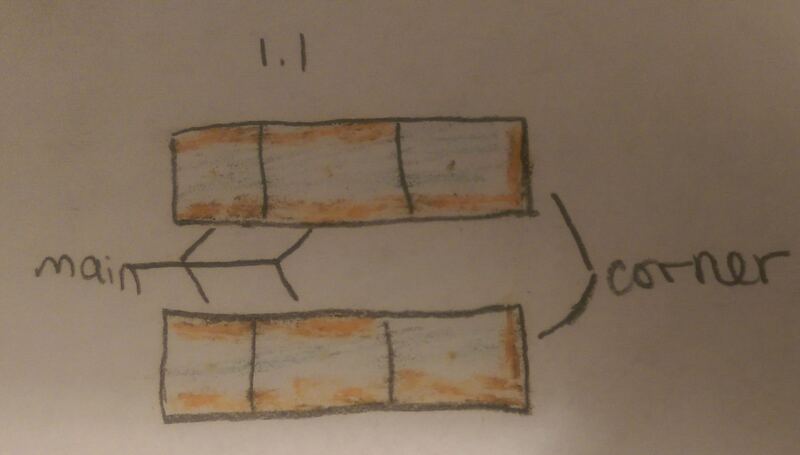 Working through both motifs, join with A in corner ch-1 sps, ch 3 (counts as first dc), 1 dc in next dc and each dc and ch-1 sp to next corner ch-1 sp (lining up and working through both motifs), finish off (21 dc). Repeat this with other two main motifs. Use diagrams 1.2 and 1.3 to finish joining the motifs to create a classic poncho shape. Use the same method as previously described for joining motifs. 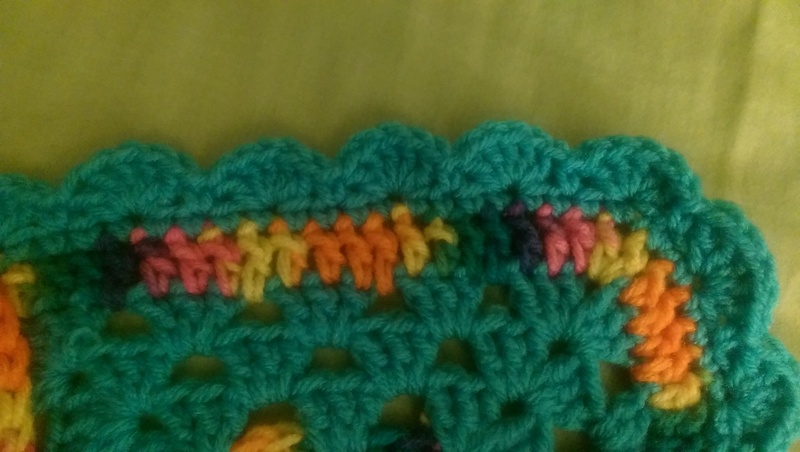 Special note: When joining motifs, you should have a raised row of stitches between the motifs when laying them flat. This will add texture to your finished product. You can also opt to join the motifs by sewing them together in a traditional manner instead of using this method. Edging: Join with B in any dc along bottom of poncho, ch 3 (counts as first dc), *skip the next dc, 5 dc in next dc, skip next dc, 1 dc in next dc, repeat from * around to first dc, sl st in first dc, finish off. Round 1: Join with B in any dc along top edge of poncho, ch 3 (counts as first dc), 1 dc in each dc around to first dc, sl st in first dc, finish off. Round 2: Join with A in any dc, ch 2 (counts as first sc), 1 sc in each dc around to first sc, sl st in first sc, finish off.